PROOF is a CIHR-funded, interdisciplinary research program working to identify effective policy interventions to reduce household food insecurity. The full size fact sheets are available for download. Food insecurity - the inadequate or insecure access to food due to financial constraints - negatively impacts physical, mental, and social health, and costs our healthcare system considerably. 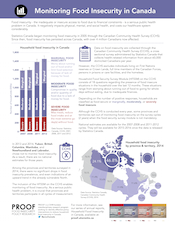 Statistics Canada began monitoring food insecurity in 2005 through the Canadian Community Health Survey (CCHS). 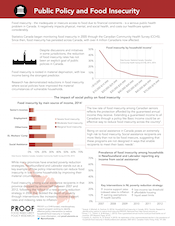 Since then, food insecurity has persisted across Canada, with over 4 million Canadians now affected. 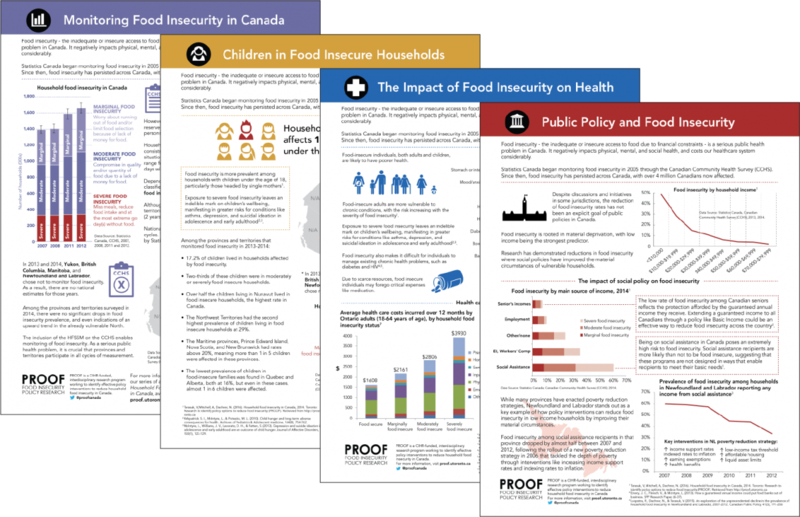 PROOF has created a series of fact sheets on food insecurity which summarize important information about the problem in Canada: monitoring food insecurity, children in food insecure households, the impact of food insecurity on health, and public policy and food insecurity. It negatively impacts physical, mental, and social health, and costs our healthcare system considerably. On November 17-18, 2016, PROOF will host the first ever Advancing Food Insecurity Research in Canada. The conference will be an opportunity to take stock of the current state of knowledge and forge an agenda that will lead to more effective responses to food insecurity. 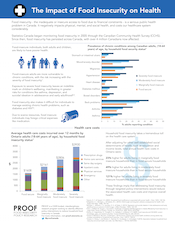 Statistics Canada began monitoring food insecurity in 2005 through the Canadian Community Health Survey (CCHS). Since then, food insecurity has persisted across Canada, with over 4 million Canadians now affected. PROOF is looking forward to participating in Resetting the Table and will be a part of the Making Zero Hunger Real sessions, presenting Food Insecurity 101 - the evidence-based fundamentals of food insecurity in Canada and opportunities for advocacy. This topic will be one of the many issues debated during Resetting the Table, FSC’s 9th Assembly (Toronto - October 13-16, 2016). A grounded understanding of food insecurity in Canada is necessary to effectively move forward on FSC’s commitment to zero hunger, while also pursuing the concomitant goals of healthy and safe food and sustainable food systems. 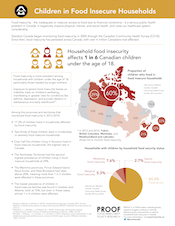 Drawing on over 20 years of research, this session will present evidence-based fundamentals of food insecurity in Canada - how food insecurity is measured, the current prevalence and trends over time. What are the causes and consequences of food insecurity and how can it be addressed? Workshop participants will identify opportunities for advocacy around issues such as basic income in light of the existing evidence. 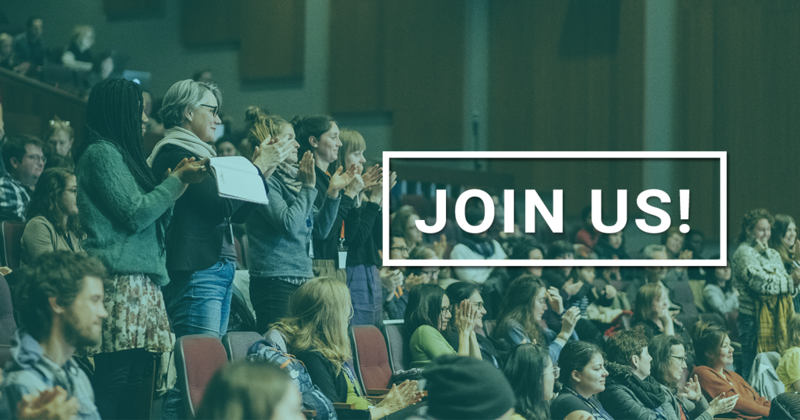 Making Zero Hunger Real (Part 2) is a participatory workshop to explore opportunities for the food movement to get organized to fight food insecurity, the tactics that might help us to advance them, and the audiences that should be targeted by any campaigns. We will explore a number of policy proposals that are gaining traction in Canada, including: a basic income guarantee (both provincial and federal); initiatives to address northern and Indigenous food security; the move toward a federal tax credit to incentivize a reduction in corporate food waste through donations to food charities; and indexing the child benefit to inflation. What can we do to insert ourselves in this conversation to ensure that the evolving policy initiatives serve the communities we work with?